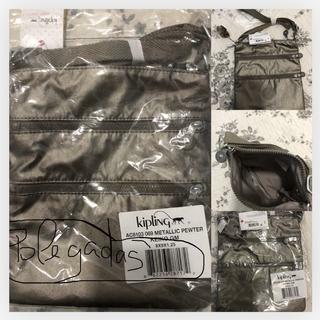 https://www.kipling-usa.com/keiko-metallic-mini-bag/100211473.html Keiko Metallic Mini Bag Petite yet practical. Featuring a slim profile and adjustable strap, this lightweight crossbody tackles your busiest days in signature Kipling style. Cute bag, great for travel, but picture is a lot lighter than the actual color. Looks more like metallic gray. It is pretty. Color is a little off, but I'll keep it. I recommend this product. Is very good. I wish strap was padded and a little longer I am 5.9 overall it's a great small bag that can hold many items. Present for my daughter who doesn't want anything but she wanted this. Beautiful color and it seams to be a good choice for my cousin, a 10 years old girl that loves Kipling. I loved the size and color. Nice gift to a friend. I like this color and size. I love mini bags. They are the perfect size for me. I like having a metallic one for dress up. It fits in a backpack and is nice enough to use with my LBD when travelling.